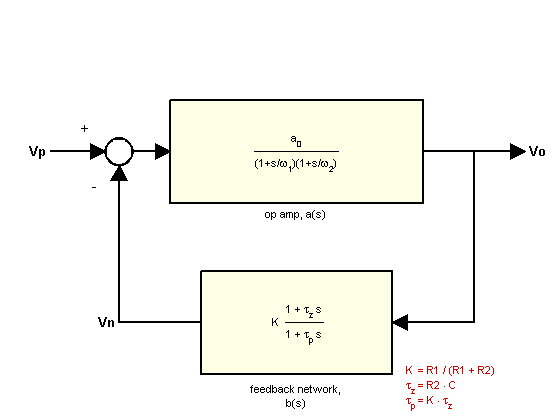 This example shows the design of a non-inverting feedback amplifier circuit using Control System Toolbox™. This design is built around the operational amplifier (op amp), a standard building block of electrical feedback circuits. This tutorial shows how a real electrical system can be designed, modeled, and analyzed using the tools provided by Control System Toolbox. 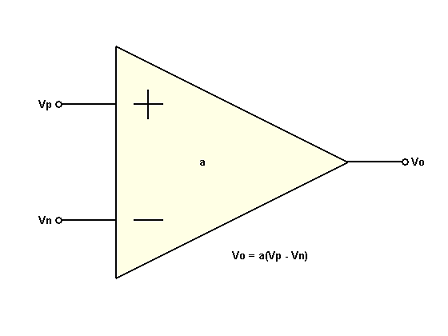 The standard building block of electrical feedback circuits is the operational amplifier (op amp), a differential voltage amplifier designed to have extremely high dc gain, often in the range of 1e5 to 1e7. The electrical symbol for the op amp is shown below. This example assumes the use of an uncompensated op amp with 2 poles (at frequencies w1,w2) and high dc gain (a0). 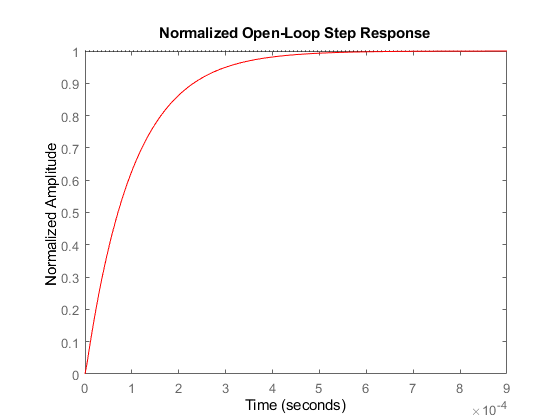 Assuming this op amp is operated in its linear mode (not saturated), then its open-loop transfer function can be represented as a linear time-invariant (LTI) system, as shown above. 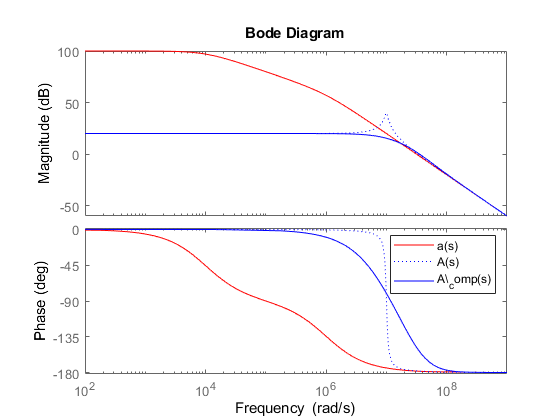 Though higher-order poles will exist in a physical op amp, it has been assumed in this case that these poles lie in a frequency range where the magnitude has dropped well below unity. Next, you want to create a transfer function model of this system using Control System Toolbox. 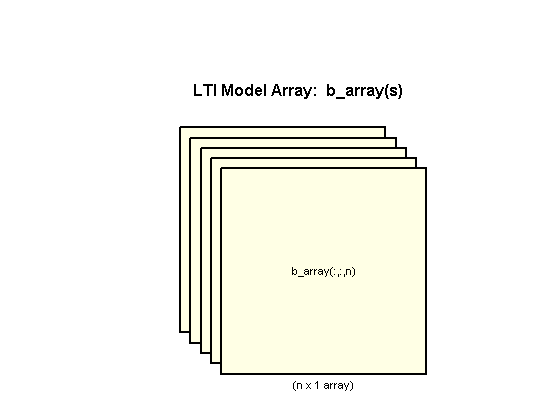 This model will be stored in the MATLAB® workspace as an LTI object. 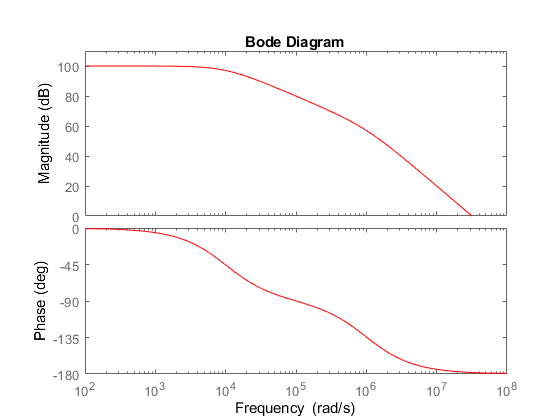 Right-click on the plot to access a menu of properties for this Bode Diagram. Left-click on the curves to create moveable data markers which can be used to obtain response details. 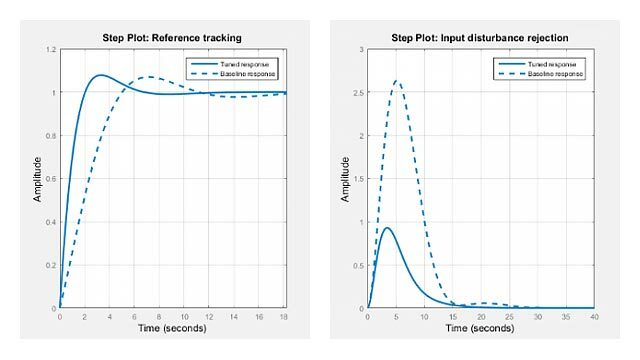 Right-click on the plot and select "Characteristics -> Settling Time" to display the settling time. Hold the mouse over the settling time marker to reveal the exact value of the settling time. Now add a resistive feedback network and wire the system as a non-inverting amplifier. The block diagram representation of the system is shown below. The use of negative feedback to reduce the low-frequency (LF) gain has led to a corresponding increase in the system bandwidth (defined as the frequency where the gain drops 3dB below its maximum value). 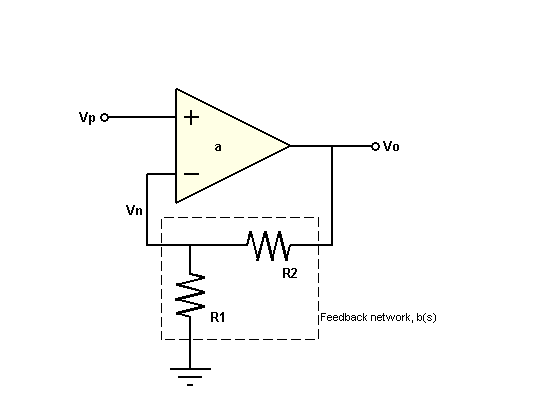 This gain / bandwidth tradeoff is a powerful tool in the design of feedback amplifier circuits. 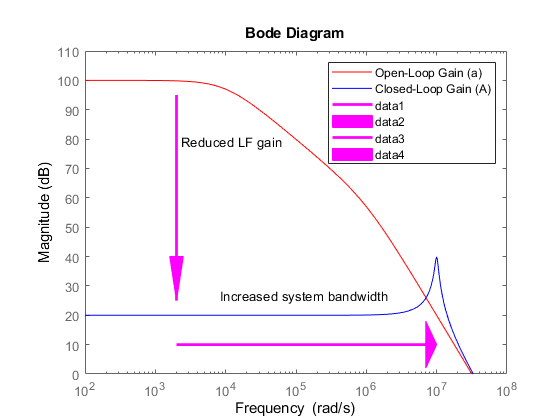 Since the gain is now dominated by the feedback network, a useful relationship to consider is the sensitivity of this gain to variation in the op amp's natural (open-loop) gain. You will use this quantity to evaluate the system sensitivity and stability margins. The system sensitivity, S(s), represents the sensitivity of A(s) to variation in a(s). The inverse relationship between S(s) and L(s) reveals another benefit of negative feedback: "gain desensitivity". 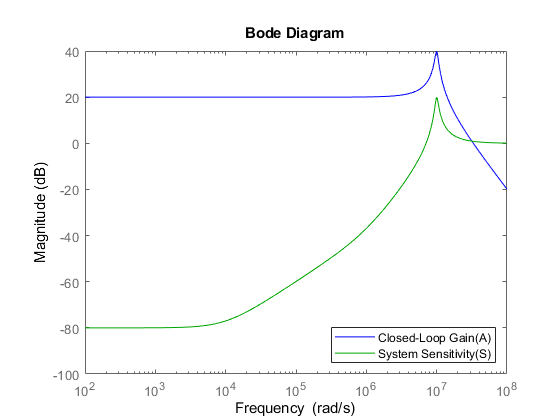 The very small low-frequency sensitivity (about -80 dB) indicates a design whose closed-loop gain suffers minimally from open-loop gain variation. Such variation in a(s) is common due to manufacturing variability, temperature change, etc. Note that the use of feedback has greatly reduced the settling time (by about 98%). 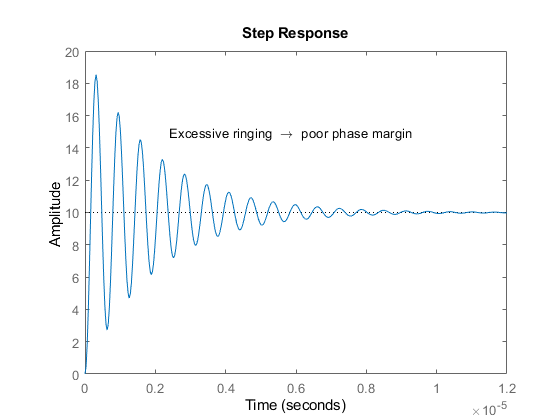 However, the step response now displays a large amount of ringing, indicating poor stability margin. 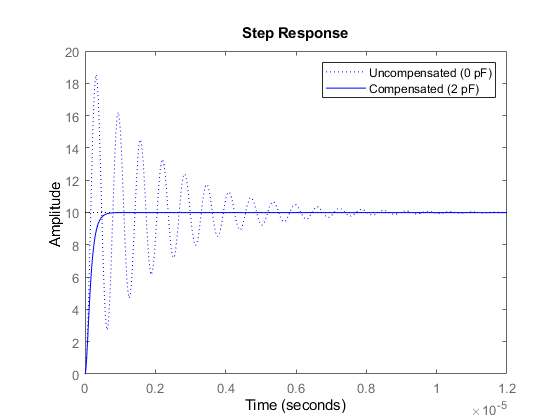 The resulting plot indicates a phase margin of less than 6 degrees. You will need to compensate this amplifier in order to raise the phase margin to an acceptable level (generally 45 deg or more), thus reducing excessive overshoot and ringing. 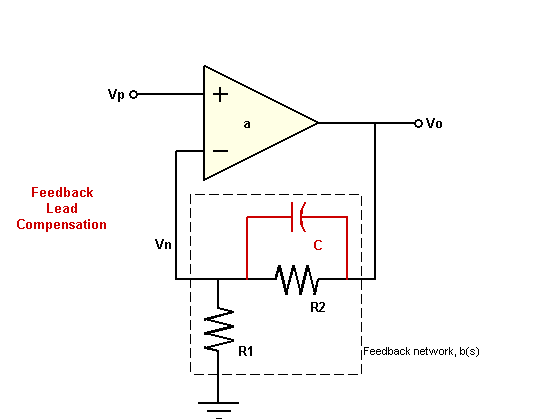 A commonly used method of compensation in this type of circuit is "feedback lead compensation". This technique modifies b(s) by adding a capacitor, C, in parallel with the feedback resistor, R2. The capacitor value is chosen so as to introduce a phase lead to b(s) near the crossover frequency, thus increasing the amplifier's phase margin. The new feedback transfer function is shown below. The phase margins may now be plotted as a function of C.
A maximum phase margin of 58 deg is obtained when C=2pF (2e-12). Note that the settling time has been further reduced (by an additional 85%). Note how the addition of the compensation capacitor has eliminated peaking in the closed-loop gain and also greatly extended the phase margin. 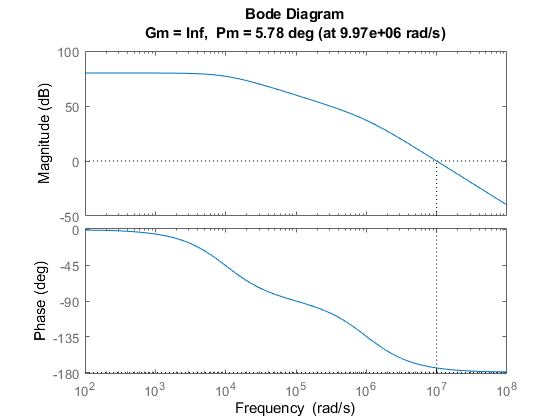 Final component values: R1 = 10 kOhm, R2 = 90 kOhm, C = 2 pF. 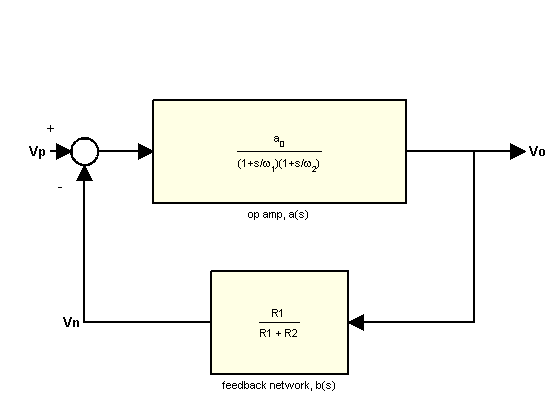 A resistive feedback network (R1,R2) was selected to yield a broadband amplifier gain of 10 (20 dB). 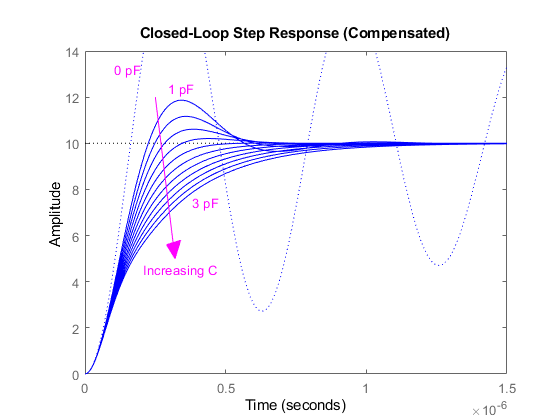 Feedback lead compensation was used to tune the loop gain near the crossover frequency. 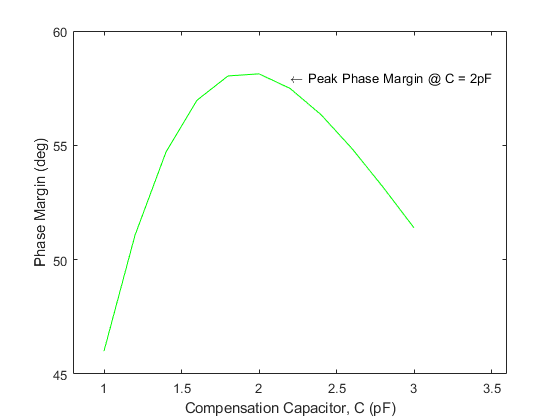 The value for the compensation capacitor, C, was optimized to provide a maximum phase margin of about 58 degrees.